You are here: Home » Uinta Brewing’s Labyrinth Black Ale: Barrel Aging with Licorice? Uinta Brewing’s Labyrinth Black Ale: Barrel Aging with Licorice? 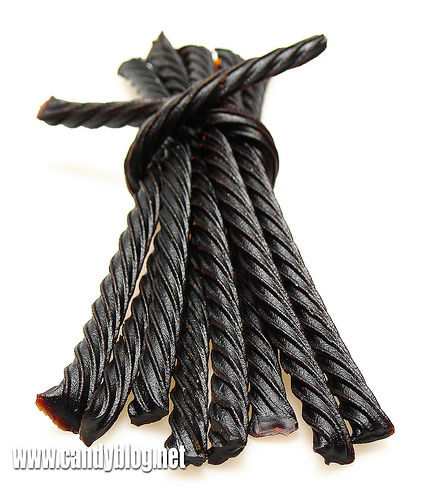 I love Black Licorice. I mean I will climb trees for the stuff. If someone said there was a bag of it on the roof I’d have my ladder out in a flash and make my son climb up there and get it for me! (what else are kids for?). I love the stuff, but in a beer? Meh…I wasn’t sure. I know I’ve had some stouts before that get the flavor of licorice in them, Victory Storm King and Avery Mephistopheles come to mind. These are great beers, but they didn’t add licorice, they just brewed a licorice flavor. So I was very skeptical when I saw Uinta Brewing’s Labyrinth Black ale, because it was aged in barrels with licorice. This was a truly inspired brew. Every once in a while you get a beer where you can taste the craftiness in it (looking at you Dragon’s Milk) and this is truly one of those beers. As you can see it came in a corked 750 ml bottle which almost ensures it will be great…right? Well this brew did not disappoint. I didn’t refrigerate this beer, instead i kept it in my garage which stays a constant 54 degrees in the winter. A perfect environment for stouts and darker beers. The pour was a dark brown color, but when it got into the glass it blackened up and had a thin cappuccino colored head that left lots of lacing. Of course the flavor is most important, and where I would be the most skeptical. I didn’t expect a lot even though people had been telling me how great it was, because I expected a very full nose, but what I got was very understated. A little maltiness, but that was about all. However when I took my first sip, I knew this was no ordinary beer. I was expecting a lot of licorice and a stoutiness to it, but it wasn’t like that at all. It was very mellow and the licorice flavor was just a hint up front, and then again in the finish. The middle was roasty, and full of barrel notes of caramel and vanilla. All in all it was very good. Tasty, and crafty. I was expecting some sort of licorice sludge but what I got was a light, crisp and tasty black ale that completely lives up to its hype. I guess at least its local hype out west here. The good news here for most folks that frequent this blog is that they are out west and in the East. They cover most of the eastern seaboard and the intermountain west…sorry California. But they are expanding like most good breweries do and I’m sure before too long they will be coming to your state. If you find this pick it up. It was fantastic. Hmm. Sounds like a beer I’d like so I’ll look for it. Jim, have you seen it in JRZ? I think you would like it Scott. It is very big though. 13.4% ABV. So have someone to share it with, or you can drink it all with a pizza and some Cheetos. Labyrinth was one of my favorite’s this year. Love that beer. I had the Abyss and the Labyrinth side by side last week. Both wonderful, both brewed with licorice, but different experiences. The Abyss is more singular in its presentation. Everything, tastes in particular, marries together in a perfect, holistic way. Labyrinth on the other hand presents everything in a series of expressions that are unique and perceptible but flow and build upon one another. And unlike the Abyss, you should be able to get Labyrinth at numerous times of the year. As long as they can keep up with demand! I didn’t know that the Abyss had licorice in it. I have an 09 abyss that I have been sitting on for over a year. Might have to break that one open one of these days. It would be interesting to have a Labyrinth that had a year or two of aging on it. I’m sure it would be better still. Yeah, I’m sitting on a couple of Labyrinth bottles for a year. I think all those different flavors and smells would coalesce more over time. It will be interesting to see what happens to it. It might end up more like the Abyss, in that regard. Aside from licorice, I believe the Abyss has some molasses in the mix, too. I liked that Barleywine. I thought it had a milder type flavor that was probably mellowed by the barrel aging. I’d purchase that again, but it is interesting that that beer stays on the shelves far longer than the Labyrinth. I’m not sure it stays on the shelves longer per se. Rick told me he’s selling more Cockeyed Cooper than the Labyrinth. Though that might change if he could always get the Labyrinth. I was at the recent Uinta tasting and the brewer told me that the supply issue for Labyrinth is partly do to the aging. It’s aged longer than the Cooper and the time Labyrinth takes to age just right is more nebulous than the brewer would like. They try to predict batch availability but it’s tough. Nice to know that he won’t let it out of the barrels until it’s to his liking, regardless of how many people are yelling at him for it. I agree totally Chad. I hate it when breweries bow to pressure and put out an inferior product. But glad to hear that Uinta is just like EJ Gallo—they will sell no beer before its time! @GregK – cool. I have a Shop Rite Liquors in Emerson that I’ll check. I love black liquorice! Like BeerPoet, this was also one of my favorite beers last year. I bought it without really knowing anything about Uinta, and I was a little wary about the price, coupled with some concern that the licorice would be overwhelming. But the label was cool, and I figured that at 13% I would at least get a good buzz. It was awesome and after reading Don’s earlier comment about it flying off the shelves in Idaho, I made sure to grab a couple for the cellar. They occupy an honored place next to my bombers of The Abyss. I’d love to do a side-by-side tasting of both of these, maybe throwing in a Yeti for good measure . . .